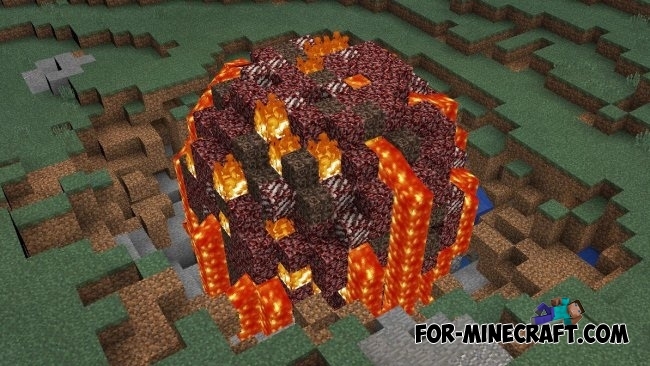 Meteors mod adds 9 different types of meteors in MCPE 0.14 that will fall from the sky and pull down the earth's crust. Meteorites and meteor rain can be turned off using simple text commands. Also modification contains radar's function that will notify you as soon as the meteorite to land on ground. Thus, you will know what kind of meteorite fell, and where exactly it is located. Meteors have a huge damage effect! "/ net start" - generation of meteors in the sky of the game world. Now the heavenly bodies will fall to the ground in a random order. In our case, we can see how the Meteor-Monster fell to the ground. It caused a massive explosion. Meteors contain a lot of valuable metals such as gold, iron, and expensive crystals. Use the following text command - "/ met End" to disable the notification about the fall of meteorites. If you want to see a meteorite near your location, you need to type a command "/ met create". There are 9 various meteors, which can be generated by a random method in the world of Minecraft Pocket Edition, if you have enabled the text command: "/ met start". But you can manually spawn different meteorites. Now we will tell you about each type of meteorite (their structure and level of danger). This meteorite falls very often. It may be small and medium-sized. It contains the coal, iron and lava. A dangerous type of meteor small size, which consists of ice and snow. 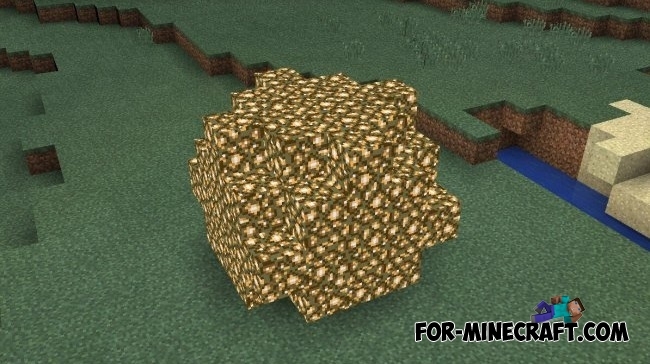 It contains gold, iron, coal and many lava. One of the most dangerous meteorites that can fall sharply to the ground. It has all types of ores. Meteor is quite rare. It can be small or medium-sized, it contains a glowing stone. In this meteor, you can get all the items that you are known from the Nether World: soul sand, nether wart, lava and quartz. 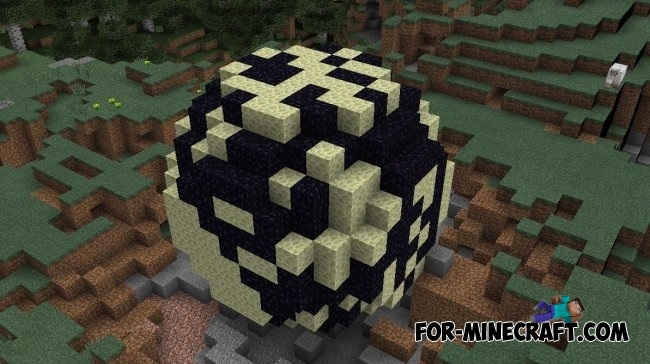 Ender Meteor contains in the structure a lot of obsidian blocks and ender stone. 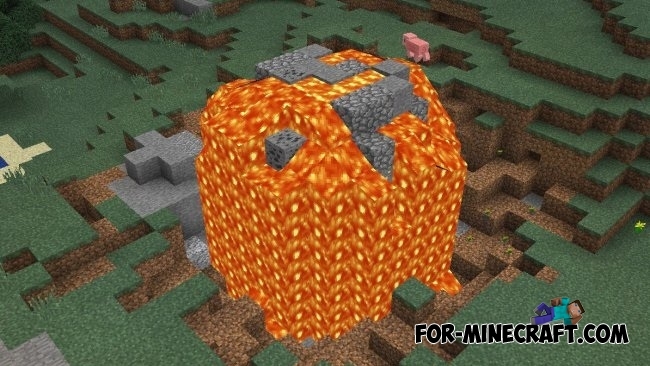 It is not very dangerous, because it does not have lava. This meteorite is composed of "space debris". You should be wary of this type of meteors, because it is a celestial body of enormous size! 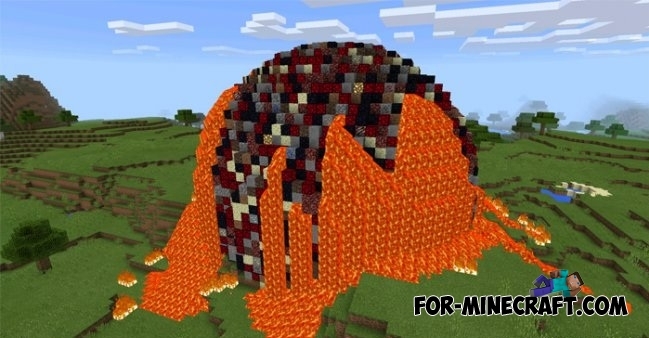 He is incredibly huge, but contains various ores: gold, diamonds, iron, and a lot more other blocks. Mini meteorites is probably one of the most curious phenomena in the world. These meteorites are small (very tiny). Fire small meteorites are not really affect at the destruction of the earth's crust - they just set fire to the ground for some time.